I recently undertook a residential architecture and interior photography shoot near Haslemere, Surrey for Guildford based practice, C7 Architects. C7 Architects are an architecture practice based near Guildford, Surrey, UK. Their management team, with over 30 years of combined experience, have successfully delivered projects ranging from £100k to in excess £50m across the UK. They had previously been using a local photographer with which they'd had a good relationship, but they were keen to take things to the next level as the are growing fast and going after larger clients and bigger projects. Karen Laughlin, who coordinates photography at C7 said "We were a little nervous using a new photographer, but Mark had very high quality work and he was thorough in his planning and approach, which gave us confidence". 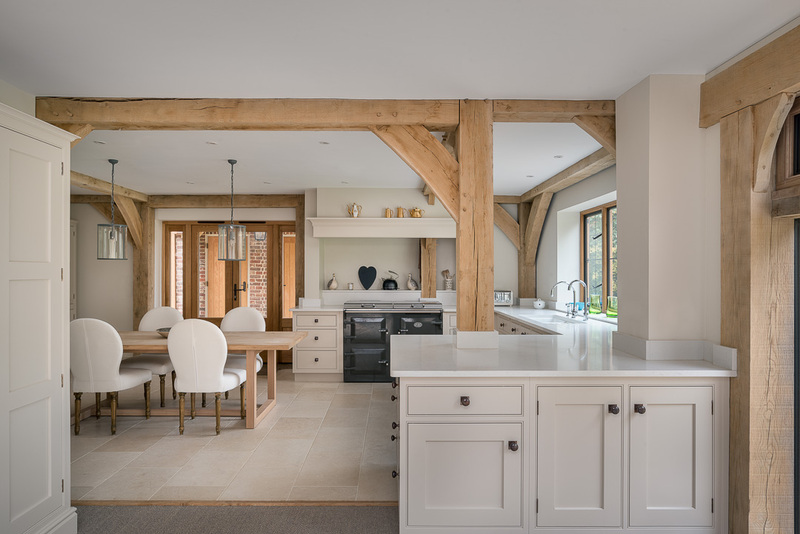 This was a renovation and major extension to a listed 15th century farmhouse near Haslemere, Surrey. 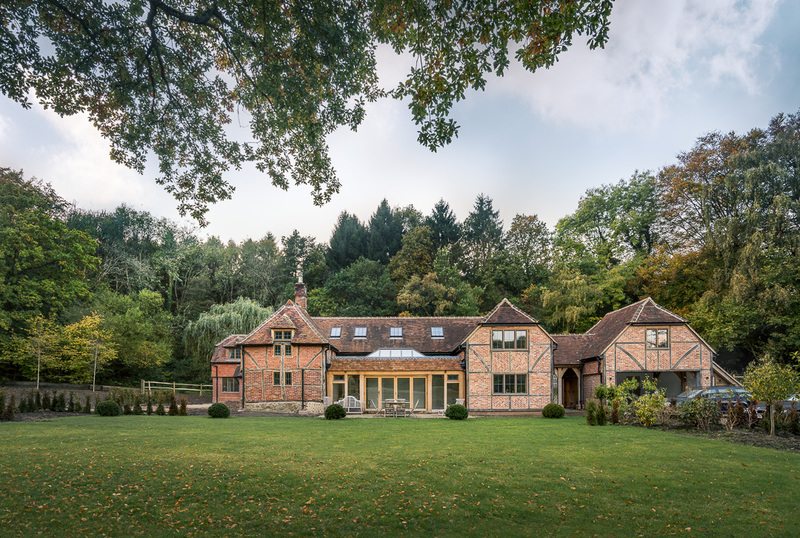 The architect designed an extension roughly three times the size of the original house supported by a completely new oak frame structure, fabricated by Cobham based Living Oak. The centrepiece of the new 4 bedroom home is a double-height hallway and landing which, together with a new dining room connects the old cottage to the kitchen and master bedroom and creates a fantastic entrance to the new house. A further extension to the north provides a double garage and study linked to the house by a covered roof. My client's brief was to tell the story of the new spaces created and how the new section integrates seamlessly with the old house to create a design sympathetic to the history of the site and the local area. In terms of the architectural photography, my aim was to show the exterior within its context of the surrounding land and illustrate the two sides, old and new. 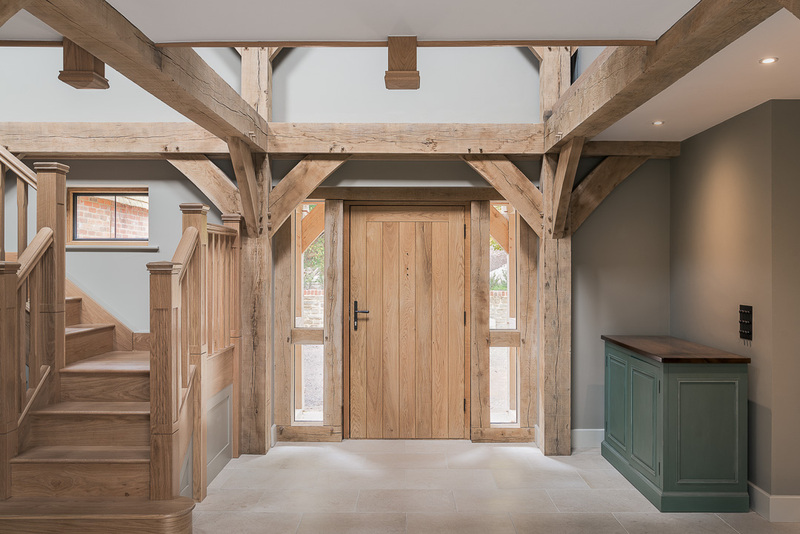 On the interior, my focus was on the newly created rooms and especially how the oak frame structure is revealed through the interior in many different ways. I paid special attention to the double-height hallway and landing which provided a real feeling of light and space compared to the original building. On the day of the shoot, there were various challenges to overcome such as poor weather and unfinished landscaping. I used the diffuse light to create a natural feel in the interior shots and on the exterior, I used the moody weather to my advantage to create a twilight photo which adds inviting warmth and hides many of the distracting imperfections resulting from the unfinished landscaping. There was also a good amount of post production work required to completely eliminate those distractions and keep the eye focused on the amazing design. Karen said, "Communication was great throughout. Mark was efficient and very easy to work with". C7 architects were delighted with the quality of the images and are now using them on the homepage of their website. "The final images were over and above our expectations", said Karen. "Mark is the perfect architectural photographer with a great eye for detail. We look forward to working with him again soon".